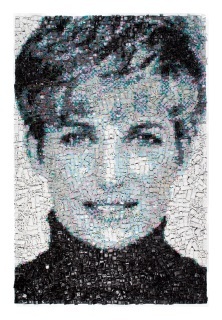 Diana – made from cars! Joe Black’s latest exhibition at The Opera Gallery literally grabbed our attention. As we hurried across London from a quick coffee with the two of the UK’s nicest theatre producers at the Trafalgar Hotel I took my usual detour around Mayfair for a bit of gallery window shopping. The galleries around Cork Street always win out over the rumblings of a missed breakfast. After all, life’s not too short for culture! Time also for another favorite on the way up to the tube. I’ve always enjoyed The Opera Gallery for a modernist sneaky peak in Bond Street and what better excuse than to share it with a business colleague in need of cultural exposure – whether he wanted it or not! We arrived. The door was shut – my mission to educate, dashed. But what’s this? The door was flung open and we were pretty much pulled inside by security (frankly a unique personal experience – its usually the opposite that happens to me) and we were made welcome with soft drinks and croissants. Breakfast and culture! Whoopeee! But all the usual fun fluffy stuff had gone – replaced by crafted pictures of Diana, Obama, Warhol, and Picasso. Get up close and see that Diana is made from small cars, Obama from lots of tiny painted soldiers. There’s got to be a message there somewhere. 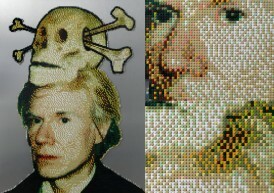 I’ll have to go back for my usual fix but the Joe Black exhibition is a worthy substitute. You know, if you get a moment, pop around to The Opera Gallery. They seem a good bunch – and if you’re a tourist the lovely staff are French, Italian – all sorts. They even let poor, hungry people like me in. Crumbs – if it was my gallery I wouldn’t share that stuff with a soul. But as it’s not, press your nose against the window for the private view tomorrow night.